Baptism Sunday - Join us this Sunday as ten of our brothers and sisters in Christ will be water baptized. 9 a.m. Service: Justin Eberly, Jack Neiger, and Gregor Phillipps. 11 a.m. Service: Joe Caban, Seth Dienner, Alivia Garman, Akeem Garman, Tanner Kurtz, Chandler Petersheim, and Megan Petersheim. Please note there will be no Children's Church for kids from K-Grade 4 this Sunday; children will be seated with their parents in the Sanctuary. There will be no BELONG this Sunday, either. Pastor Lester will be sharing a message called "Saved and Baptized for a Purpose." Eastgate House of Prayer - Cultivating our hearts in the secret place of God's love empowers our faith and activates his power in our lives. Join us this Tuesday at 7 p.m. as Kara Sensenig shares a message on "Partnering With the Holy Spirit." As we worship and pray together, there will also be a time of prayer for healing and impartation for more of the Holy Spirit. Childcare is provided through age 7. All are welcome! Christmas Eve Program - It’s time to start getting ready for our annual Christmas Eve program! We are looking for 8-10 people for different non-speaking parts, ages 13 and up. Please contact Andrea Kauffman if interested. Decorating for Christmas - Can you lend a hand to decorate the church for Christmas on Wednesday, November 28, starting at 8 a.m.? You can stay for all or just part of the day. Lunch will be provided. If you can come, please contact Sharon Zimmerman at sharonz@petra.church . If you have friends who would like to help, bring them along! Episode 119: What Ever Happened to Pastor Gary? 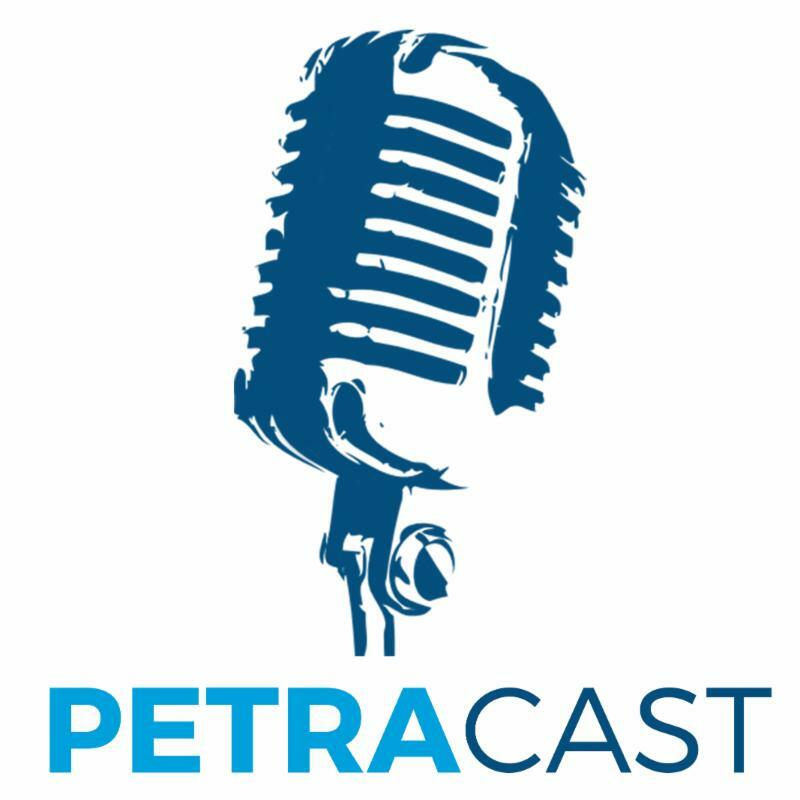 A Conversation with Petra's Former Worship Pastor - Join Jamie Detweiler as he interviews one of Petra’s former pastors, Gary Buck. Six months after Gary became lead pastor at Hopewell Church in Elverson, he pulls back the curtain on what that transition has been like, and offers something that we can all benefit from. 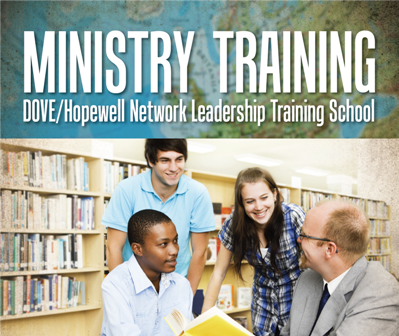 DOVE/Hopewell Ministry Training - The theme of the training this weekend is "Helping People Find Freedom." The start times are Friday at 6:30 p.m. and Saturday at 8:30 a.m. Learn how to set people free and to make them whole in body, soul, and spirit! If you want to audit the classes, you may register at the door; the cost is $125 per person or $215 per married couple For more information, go online or contact Pastor Brian Flewelling . 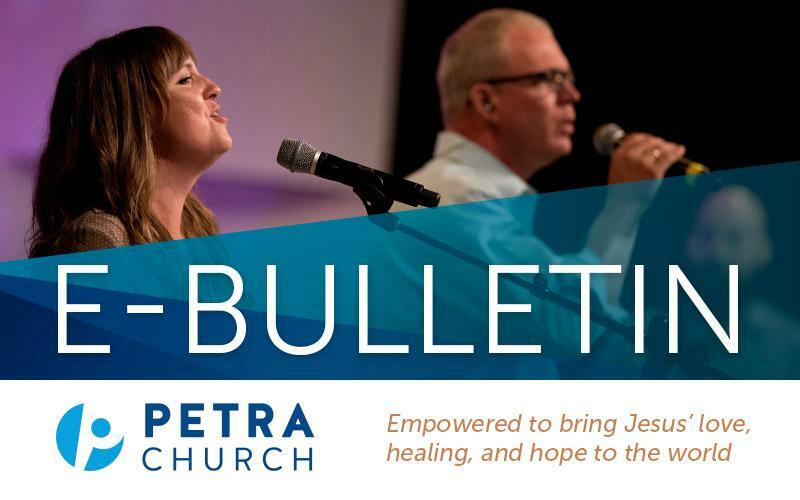 Listing of Petra Events - Check out what's happening over the next few weeks at Petra. 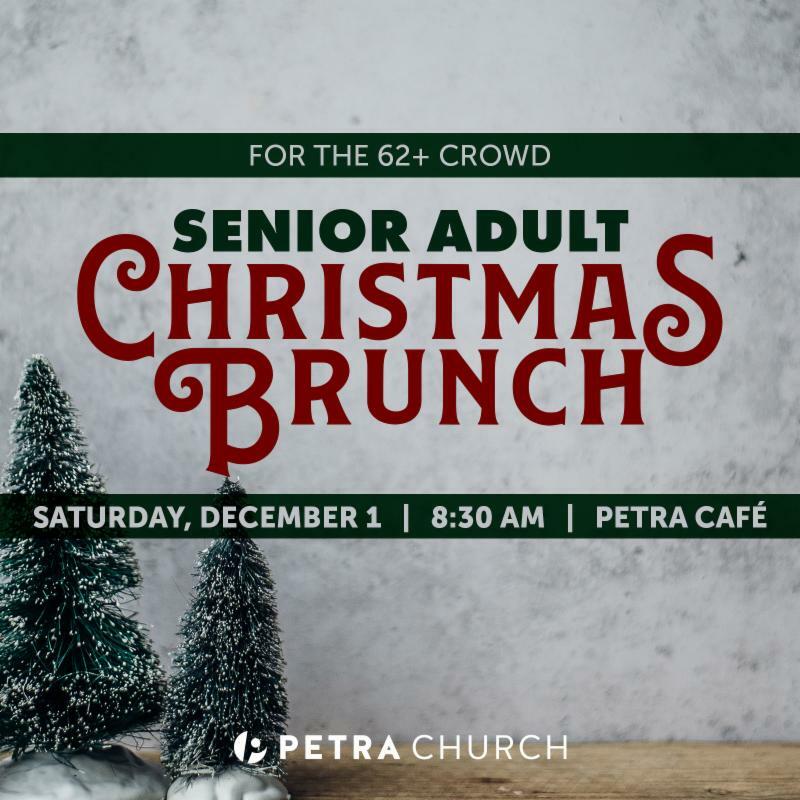 Senior Adults (62+) are invited to a Christmas Brunch on Saturday, December 1, at 8:30 a.m. in the Petra Café. Come for delicious food catered by Welsh Mountain Catering and for entertainment by Nick DiSanto, the One-Man Band. For an introduction to this unique musician and sculptor, visit this website . The cost is $10 per person. Register online by November 29. All married couples under the age of 40 are invited to a Young Marrieds at Petra social event this Sunday from 5 to 7 p.m. in the Café! Pulled pork sandwiches will be provided. Please bring a side dish or dessert to share. Children are welcome! Questions about this event? Contact Henry or Kaci Fisher. 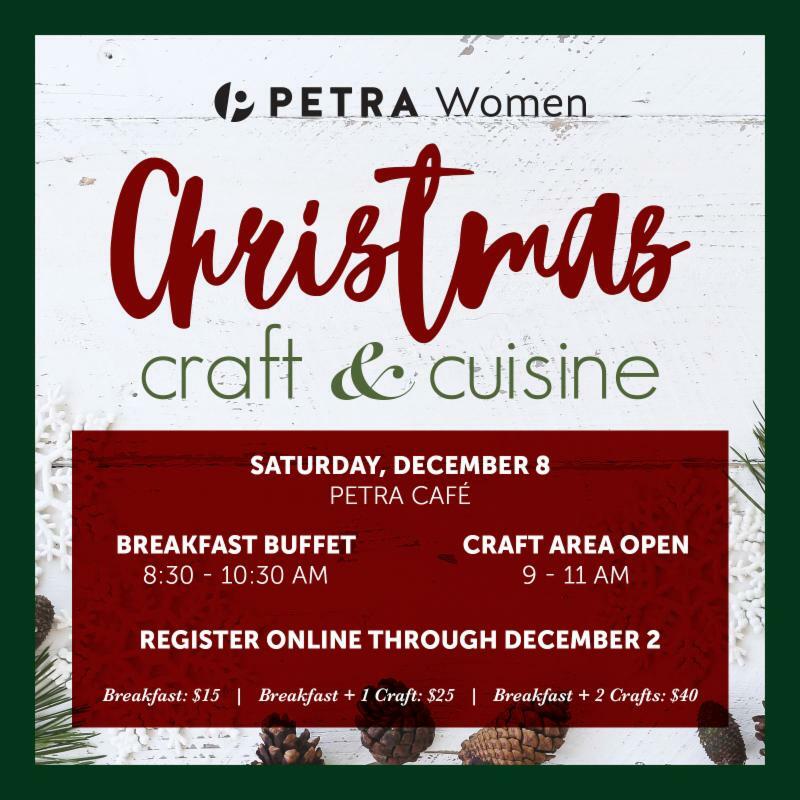 Join us for a beautiful Women’s Christmas Craft and Cuisine event – with live music – on Saturday, December 8, in the Petra Café! Enjoy an amazing breakfast buffet anytime between 8:30 and 10:30 a.m. and then create either one or two Christmas crafts! The cost is $15 for breakfast with an additional charge per craft. Register online by December 3. 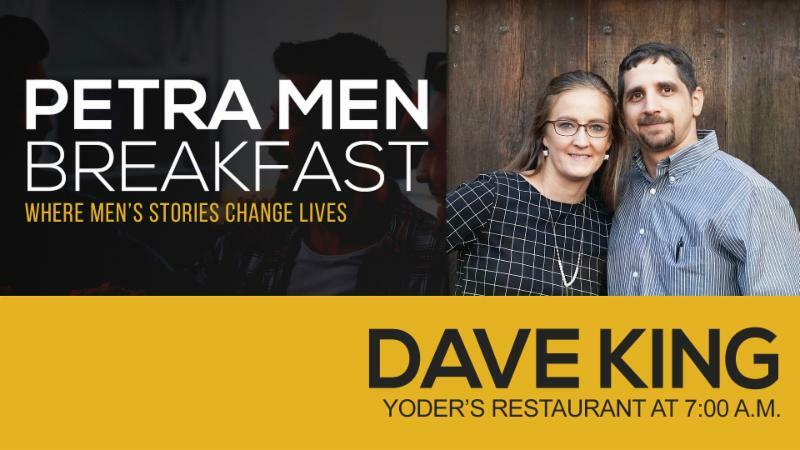 Men's Breakfast - All guys age 13 and up are invited to a Men's Breakfast at Yoder's next Saturday, November 17, at 7 a.m. David King will be sharing his story, with a focus on the joy of serving others - whether though the local church, fire department, local community, or work environment. 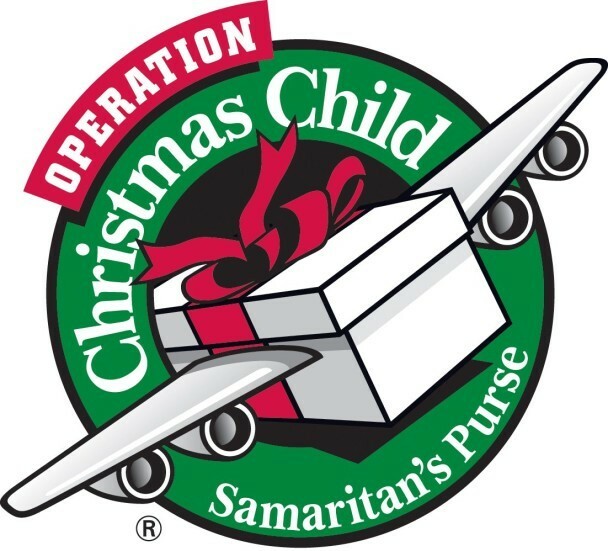 Other OCC Opportunities - Petra is our area’s Drop-Off Center where other churches and individuals bring their filled shoeboxes. Here we document the number of boxes and place them into cartons to be loaded into semis and shipped to the Baltimore Processing Center. Volunteers are welcome to come help at the Drop-Off Center from this Monday through next Monday . Volunteers of all ages are welcome! Contact Marilyn Coles at 484-880-1638 or mgcoles@aol.com to save your volunteer spot. Want to be a part of what happens next? Join Marilyn Coles as she leads a team from Petra to the Operation Christmas Child Baltimore Processing Center on Wednesday, November 28. The times are 2 to 6 p.m. Volunteers will meet at Petra at 11:30 a.m. and return around 8 p.m. You will sort and prepare the shoeboxes for their final stage before being shipped to countries around the world! Children ages 14 and up, accompanied by an adult, are welcome to help. Please contact Marilyn Coles (contact info above). It's BIG, and it's coming next weekend! 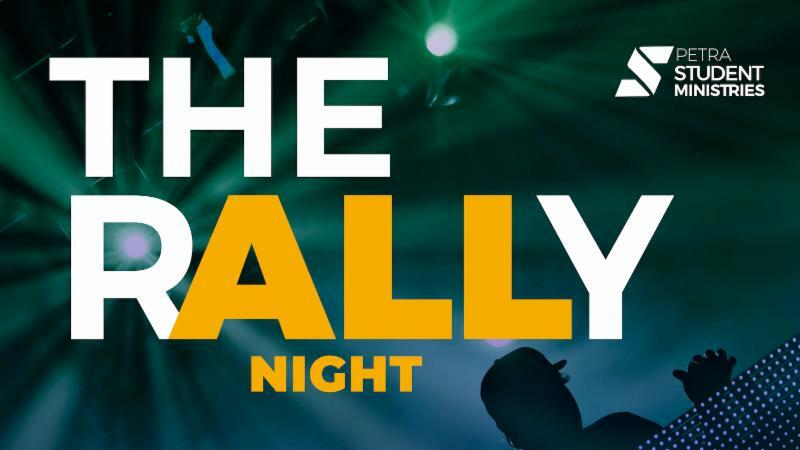 You will not want to miss The Rally All Night , a regional event for high school and middle school (6th-8th grade) students on November 16-17 from 7 p.m. to 7 a.m.! It starts at Petra with a concert by KB, Beacon Light, Kevi Morse, and DJ YNOT?, along with a performance by illusionist Jared Hall. There will be games, giveaways, worship, and a message. Following that portion of the night, everyone will head to Spooky Nook, where the fun continues with activities such as rock climbing, arcades, sports, movies, and music. The event ends at 7 a.m. after breakfast at Shady Maple Smorgasbord. The cost is $50 per student. Visit www.petra.church/therally for more info and to register. Parents - We need additional Petra-only chaperones to help with the “Petra portion” of The Rally that Friday from 6 p.m. to 1 a.m. Tasks may include helping with security, concessions, greeting, etc. Volunteer clearances need to be on file at Petra to volunteer for this event. If you can help, please sign up here . Concert - If you'd like to attend the concert next Friday, November 16, with Christian rap artist KB and Illusionist Jared Hall, you are welcome! The concert is open to everyone! Join us in the Sanctuary from 7 to 9:30 p.m. The cost is $20. 2018 Extraordinary Give - Several local ministries supported by Petra are among the 500 ministries and nonprofit community organizations that have signed up to take part in this year's Extraordinary Give. Extraordinary Give is a Lancaster County 24-hour online giving marathon taking place next Friday, November 16, from 12 midnight to 11:59 p.m. Every dollar donated online will be stretched by at least $500,000 from the Lancaster County Community Foundation and various sponsors. Visit this website for more information. Helpers Needed, Christmas on Main - Come and join us as we serve our community during the Christmas on Main event in New Holland on Saturday, December 1! We are looking for a few volunteers to assist with our Barrel Train rides and to hand out candy. We need one conductor and three volunteers from 4 to 5 p.m. and three volunteers from 5 to 6 p.m. If interested, contact Keida Medina at 717-333-1019 or negra96@yahoo.com . Mission Prayer Focus - Les and Suzanne Yoder serve as Petra missionaries, with Les giving leadership to AgConnect Ministries - a ministry that uses agriculture to meet the needs of people in less-developed regions of the world and empowers them to reach their own people for Christ. Pray for God’s wisdom, open doors, and provision for them in their ministry. Pray for protection and divine appointments as Les currently is traveling in Eastern Europe through November 15. Fundraiser Meal - Come for a delicious meal of Chicken Parmesan, spaghetti noodles, salad, coleslaw, applesauce, and dessert next Sunday, November 18, at 12:30 p.m.! The proceeds will go toward Marta Estrada , who serves as Director of Restoration of the Nations, a ministry that seeks to bring freedom and healing to women in addiction throughout the world. Take-outs will be available after the 9 a.m. service. 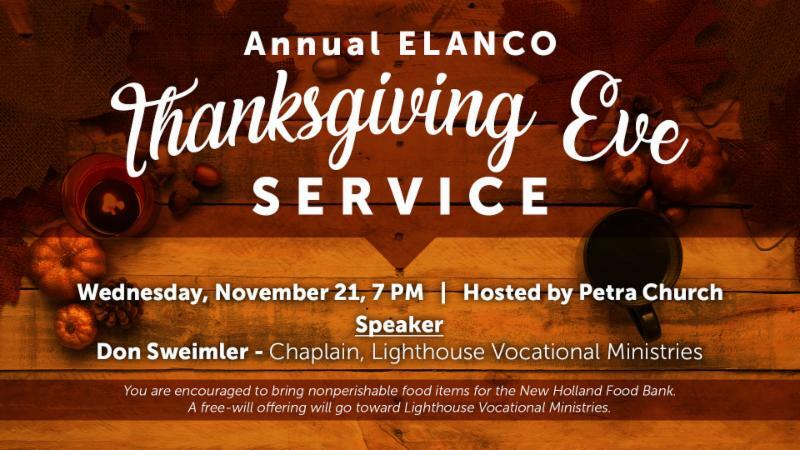 Petra will be hosting the Annual ELANCO Thanksgiving Eve Service this year. It’s Wednesday, November 21, at 7 p.m. The speaker is Don Sweimler, Chaplain at Lighthouse Vocational Ministries. An offering will be received on behalf of that ministry. Please bring nonperishable food items for the New Holland Food Bank, if you wish. Blessings to Justin and Trietia Smucker upon the birth of their daughter, Thea Evana, on Saturday. Blessings to Kendall and Elisa Reinford upon the adoption of their sons, Gabriel Daxton and William Declan, on Monday - the boys' second birthday. Congratulations to these brothers and sisters who recently joined the Petra Church family as members: Karen Adams, Sam and Fern Beiler, Randy and Stephanie Hoffert, Carina King, Kyle Martin, Loren and Connie Stauffer, Avery Stauffer, Isabelle Stauffer, and Michael Stoltzfus.